OFC for fans in JABODETABEK (Official Fans Club Member). 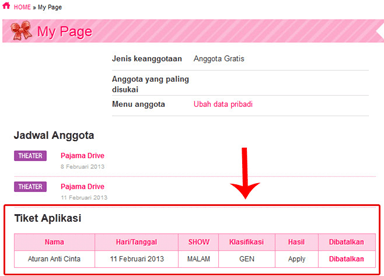 FAR for Fans outside of JABODETABEK/Overseas (Non Official Fans Club Member). General for fans in JABODETABEK (Non Official Fans Club Member). 2. E-mail confirmation will then be sent to you straight away after that (check ‘Spams’ if it is not in your ‘Inbox’). Now you are good to sign in as a user. 3. 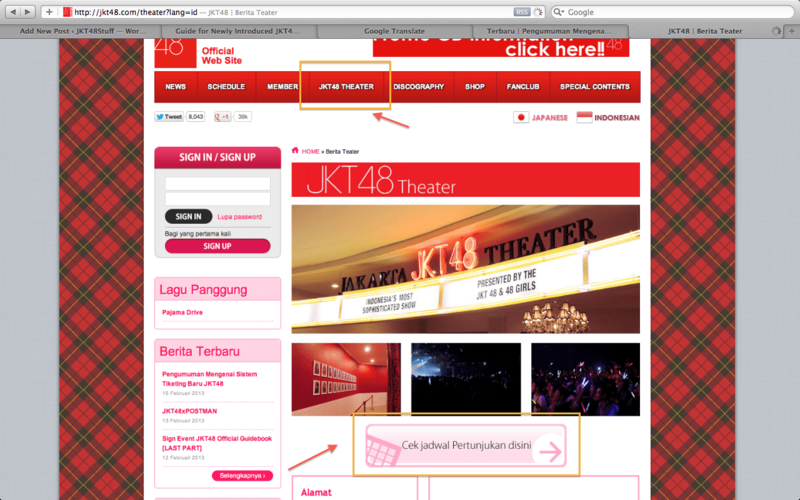 Click on “JKT48 Theater” above at the menu page, then click “Cek Jadwal Pertunjukan Disini” at the next page. The theatre’s date of the show that are available to be applied would be marked in red colour. Please choose the group which you are belong in (If you are from overseas or are not residing in Jakarta, see the second column from the right. And if you are an OFC, see the the third. and fourth for general). 4. Choose which show you want to attend, click on it. Now you will be directed into a page containing the details of the show. 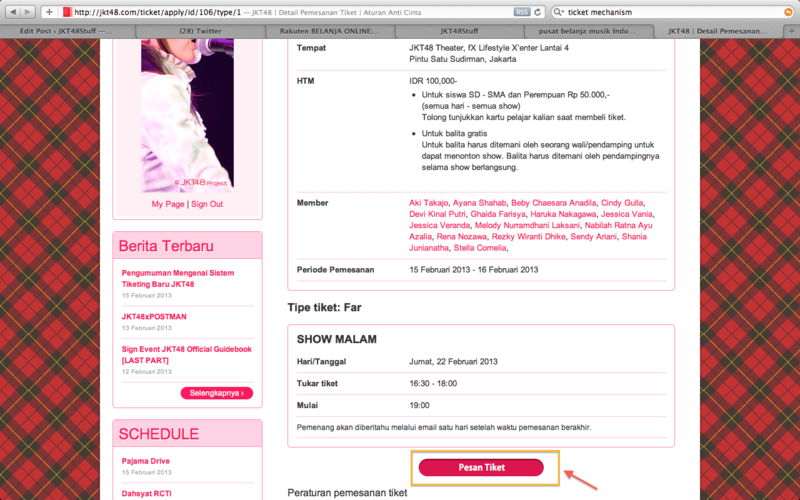 Click on “Pesan Tiket” button to order the ticket. 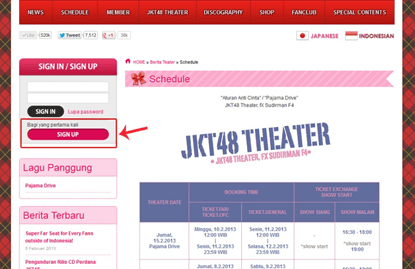 Here, your ticket ordering process is finished, ticket will be given and chosen at random. 5. The ticket winner will be chosen randomly, and if you are chosen an e-mail confirmation stating that you are a winner will be sent to you in 24 hour period after the order process done. It will also be stated in your user profile in “My Page” menu. You will also be able to cancel your ticket order if wanted, just press the “Batalkan” button, and then your ticket order will be cancelled immediately. One E-Mail address is only valid for one person. Different name listed on your ID compared to your Booking Email. Didn’t reclaimed the ticket at D-Day. 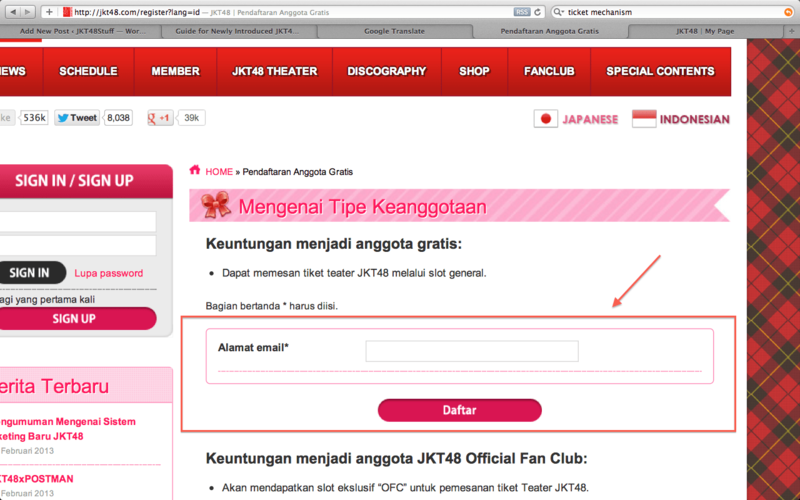 If JKT48 OFC Members didn’t get a ticket for OFC after booking, OFC Members still be able to book a general ticket afterwards (2 Chances). FAR Ticket only applied for those who lives outside Jakarta, Bogor, Depok, Tangerang, Bekasi and have the same City as written on the ID. For those who have won the booking and doesn’t use his rights for ticket redeeming, will be warned by reducing the chance you won a ticket for future booking. 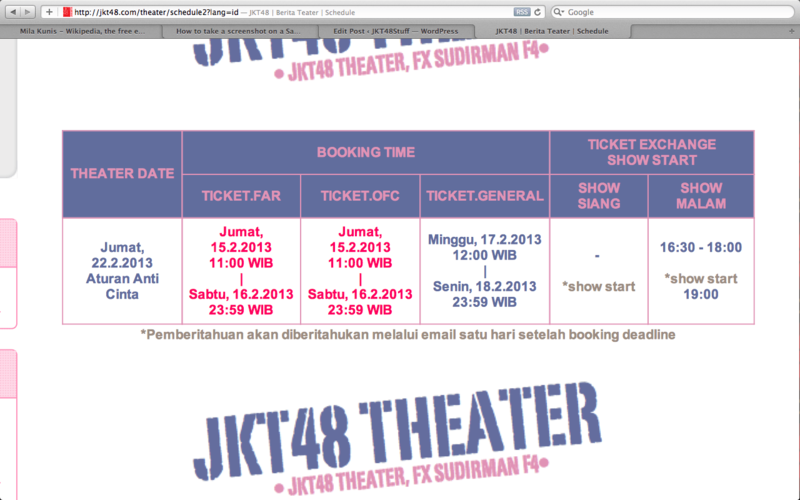 You Could Check the JKT48 schedule here.